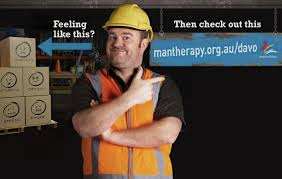 So what’s all this talk about man therapy, is it just counselling with a hardhat? The reality is that while it is important for everyone to look after their mental health, men are less likely to find someone to go and talk to about how they are feeling. Beyond Blue have just launched their new character Davo on the Man Therapy website (www.mantherapy.org.au/davo). On the site you will find a Mind Quiz, Facts and Tips and much more. There’s heaps of great information to explore. For example, a handy Guide to Mental Health that helps spot when a man needs support. It was developed by the Canadian Department of Defence and The US Marine Corps so they really know what questions to ask men. It’s worth a look through the list of FAQ’s. You might be surprised with some of the answers. Also listed on the site are a huge range of support services designed for men, including online forums for men to share stories and questions. Check out the “Other Support Services” page. There are over 40 different contacts listed. Everyone is different and when looking for the right service or someone to talk to, it might feel a bit like searching with a treasure map. If you don’t find what suits you straight away, keep hunting and asking till you find what is right for you.